Welcome - Sharing information with the community related to Microsoft SharePoint security, information protection and permissions. Topics will also cover identity federation, claims and software development. Articles will at times be technical and focussed at developers/architects. They will also be higher level and discuss concepts and customer use cases. Have a look around, share your thoughts and I do hope you find some helpful content. 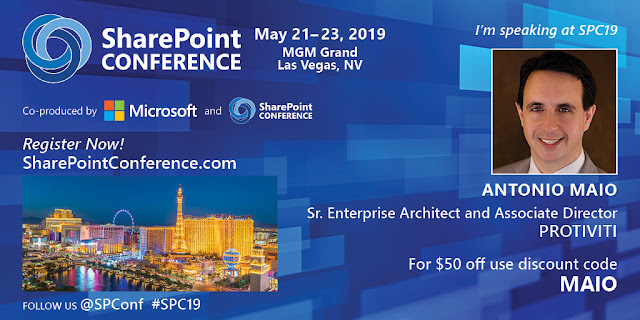 I am very pleased to announce that I will be co-presenting at the SharePoint Conference North America 2019 (May 21 to 23 in Las Vegas) with Erica Toelle. Our session is titled Discover end-to-end records management in Microsoft 365 and we're very excited to share with you all that we know about records management in the Microsoft 365 platform. Erica and I have been friends for several years, and we often discuss how organizations are managing their records and we talk about the capabilities available from Microsoft in the cloud platform. These capabilities have evolved significantly over the last year, and we're really excited to share what's now available. At Ignite 2018 Microsoft announced Unified Labeling Management. With unified labels, you have a single place to manage sensitivity labels that help classify and protect your sensitive data, as well as manage retention labels that help govern the lifecycle of your data. This unification brings together Azure Information Protection (AIP) labels and Office 365 labels into one management interface and a set of functionalities that can be used to govern data. Advanced Data Governance for Automatic Labeling The Office 365 Advanced Data Governance (ADG) feature set works together with unified labels so you can automatically apply labels to content that meet certain criteria. This way end user does not have to manually label content, ensuring it is appropriately managed for compliance and protected from misuse. Protecting Sensitive Information In the Unified Labeling Management experience, Microsoft as integrated the management of Microsoft Information Protection (MIP) labels as well. So you can now configure and manage both labels for retention and levels for sensitivity. Sensitivity labels allow us to protect sensitive content based on a classification. Data Loss Prevention (DLP) identifies sensitive information, such as social security numbers and bank account information, and adds additional policies and protections. DLP can govern sensitive information where it lives, when we route it, and when we share information. Retaining Information and Disposition Most important to Records Management is the ability to retain and delete information. We will look at how you build a file plan for Office 365 and use it to enforce retention to prevent content from being deleted. On the flip side, you can also use retention policies to delete content. For example, some organizations want to delete Microsoft Teams conversations after 30 days, similar to what was previously done with Skype conversations. Label Analytics and the Activity Explorer How can you tell if your label and records management strategy is working? That’s where the Label Activity Explorer can help. It provides analytics about the application of labels. You can look at what labels have been manually and automatically applied, where, and by whom in addition to other data. End User Experience in Microsoft 365 What does records management look like to the end user? Is it intuitive? We will look at how an end user can manually apply a label to content in SharePoint and Exchange. We'll look at how you can avoid impacting end users but still enforce record management policies for your content. We will also demonstrate what the end user sees when a label is applied automatically. Real Life Stories Implementing Microsoft 365 Records Management Finally, we'll talk about some real-life case studies of how we use Microsoft 365 Records Management in the real world. This overview includes the deployment approach, tips and tricks, and best practices. We hope to add a few more topics if Microsoft releases additional functionality before the conference in May. Antonio Maio is an information security architect with over 25 years of experience in cyber security practices and systems, product management, software development and leadership. Antonio is currently an Associate Director and Senior Enterprise Architect with Protiviti. He has been awarded a Microsoft Most Valuable Professional award for 7 consecutive years, from 2012 to 2018, specializing in Office 365 and Office Services, SharePoint Online and SharePoint server. His background includes implementing information security technologies, and both information governance and cybersecurity best practices. His experience with Microsoft SharePoint and Office 365 extends over the last 12 years. When he’s not helping enterprise solve security challenges, you can catch him speaking at conferences or contributing to the community through this blog. In his spare time, Antonio likes to oil paint, run, make wine, read and spend time with his family. Copyright (c) 2016 Antonio Maio. Powered by Blogger.